Some time ago I blogged about how to change vRealize Automation All services icon, despite the fact it was a not supported procedure by that time we could prove it was doable. Now I’m glad to say that starting with vRealize Automation 7.1 it’s a fully supported procedure, allowing you to change it in your production environment without the fear it will break something. 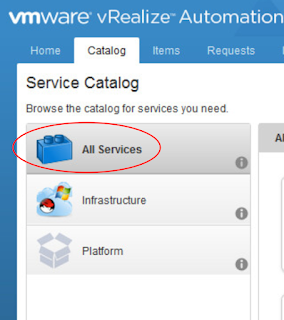 If you don’t recall, the All Services icon always appears for users which have more than one Service entitled to them. Before we go one, it’s good to be aware that it’s a system-wide configuration and likewise will affect all your tenants. You might remember about the blue boring Lego icon, right ? Let’s see how to change it then. Let’s starting converting the image you want to use as your new icon to a base64code string. As suggested you could use DailyCoding portal, just upload your image and convert it, save the string for later use. perform this change so far. Take a note of your token, in my case, it’s the yellow string I highlighted. - run: export AUTH="Bearer [Auth Token]"
Just replace the IMAGE DATA as base64 string with the string you got from your new icon.... don't worry it’s a pretty large string. BTW I’m providing the commands to run on a Linux system, if you want to run on a Windows base system, please, check the manual for the exactly commands. If you like this quick vRA 7.1 new features don’t miss my other posts: Message Board and Execution Information. Awesome.. This works...!! Great post, Eduardo...!! Thank you..